Article 92 of the Uniform Code of Military Justice is "Failure to Obey an Order or Regulation" (Written or stated). It is considered a dereliction of duty when unable or unwilling to perform the job assigned to military personnel. Such examples would be as simple as sleeping while on duty or watch / sentry, drunken or self-injury to the point of unable to perform his/her duties, and as harsh as shooting oneself to get out of required duties, deployments, or other elements of the job. Also, performing one's job in such an error that innocent non-combatants or one's own troops get injured or killed can be a dereliction of duty. (1) Violation of a lawful general order or regulation. (c) That the accused violated or failed to obey the order or regulation. (2) Failure to obey other lawful order. (d) That the accused failed to obey the order. (3) Dereliction in the performance of duties. (c) That the accused was (willfully) (through neglect or culpable inefficiency) derelict in the performance of those duties. (b) A general order or regulation issued by a commander with authority under Article 92(1) retains its character as a general order or regulation when another officer takes command, until it expires by its own terms or is rescinded by separate action, even if it is issued by an officer who is a general or flag officer in command and command is assumed by another officer who is not a general or flag officer. (c) A general order or regulation is lawful unless it is contrary to the Constitution, the laws of the United States, or lawful superior orders or for some other reason is beyond the authority of the official issuing it. See the discussion of lawfulness in paragraph 14c(2)(a). (d) Knowledge. Knowledge of a general order or regulation need not be alleged or proved, as knowledge is not an element of this offense and a lack of knowledge does not constitute a defense. (e) Enforceability. Not all provisions in general orders or regulations can be enforced under Article 92(1). Regulations which only supply general guide-lines or advice for conducting military functions may not be enforceable under Article 92(1). (2) Violation of or failure to obey other lawful order. (a) Scope. Article 92(2) includes all other lawful orders which may be issued by a member of the armed forces, violations of which are not chargeable under Article 90, 91, or 92(1). It includes the violation of written regulations which are not general regulations. See also subparagraph (1)(e) above as applicable. (b) Knowledge. In order to be guilty of this offense, a person must have had actual knowledge of the order or regulation. Knowledge of the order may be proved by circumstantial evidence. (c) Duty to obey order. (i) From a superior. 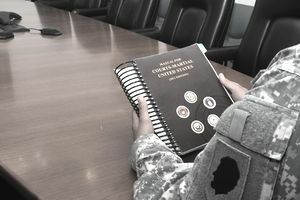 A member of one armed force who is senior in rank to a member of another armed force is the superior of that member with authority to issue orders which that member has a duty to obey under the same circumstances as a commissioned officer of one armed force is the superior commissioned officer of a member of an-other armed force for the purposes of Articles 89, and 90. (ii) From one not a superior. Failure to obey the lawful order of one not a superior is an offense under Article 92(2), provided the accused had a duty to obey the order, such as one issued by a sentinel or a member of the armed forces police. (a) Duty. A duty may be imposed by treaty, statute, regulation, lawful order, standard operating procedure, or custom of the service. (b) Knowledge. Actual knowledge of duties may be proved by circumstantial evidence. Actual knowledge need not be shown if the individual reasonably should have known of the duties. This may be demonstrated by regulations, training or operating manuals, customs of the service, academic literature or testimony, testimony of persons who have held similar or superior positions, or similar evidence. (c) Derelict. A person is derelict in the performance of duties when that person willfully or negligently fails to perform that person’s duties or when that person performs them in a culpably inefficient manner. “Willfully” means intentionally. I t refers to the doing of an act knowingly and purposely, specifically intending the natural and probable consequences of the act. “Negligently” means an act or omission of a person who is under a duty to use due care which exhibits a lack of that degree of care which a reasonably prudent person would have exercised under the same or similar circumstances. “Culpable inefficiency” is inefficiency for which there is no reasonable or just excuse. (d) Ineptitude. A person is not derelict in the performance of duties if the failure to perform those duties is caused by ineptitude rather than by willfulness, negligence, or culpable inefficiency, and may not be charged under this article, or otherwise punished. For example, a recruit who has tried earnestly during rifle training and throughout record firing is not derelict in the performance of duties if the recruit fails to qualify with the weapon.